From Protest to Power: What’s Next for #OccupyWallStreet? What was originally a small, localized protest of a few hundred people near Wall Street in downtown New York has spread over the last month to include hundreds of cities in dozens of countries, and thousands and thousands of supporters. 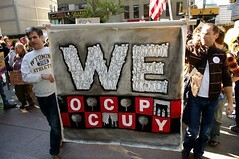 At this point, it is undeniable that the Occupy Wall Street movement has caught the attention of the world. More than thousand protesters have been arrested in support of their ideal of a more fair economic system in which the deck is not stacked in favor of those that already have more money than they could ever possibly spend. They are camping out on the streets of Manhattan and all over the world in a call for a system that does not treat those without seven-figure bank accounts as expendable and insignificant. These people are standing up for the huge majority of Americans that want nothing more than the opportunity to work and provide for the their own well-being, as well as that of their families. And, after a little over a month of protests, marches, sign-waving, and arrests, they have finally caught the attention of the mainstream media. But, now that they have the attention of the world, what comes next? The first thing that must be recognized is that Occupy Wall Street is a movement with no political affiliation, unlike the Tea Party, who were quickly absorbed by the Republican Party. Though they have been extremely critical of the Republicans and their horribly unfair financial policies, the OWS protesters do not consider themselves Democrats. In fact, they have been almost as vocally critical of President Obama and his party as they have of anyone on the Right. In their eyes, Wall Street and the entire economic system are the problem, and the Democrats are just as complicit in allowing that to continue as the Republicans. But, despite their resistance to align themselves with a political party, the fact remains that only by influencing those in power and encouraging them to vote in a certain way can the Occupy Wall Street movement hope to become a true force for change. Protest is great, but it does not change public policies. That can only be done by working within the system of government, enacting new laws and retracting old ones. I understand his position, and I respect the nobility and dignity of protest for protest’s sake. He’s right that these protesters are putting themselves at risk to stand up for something that they deeply believe in. But, it must be admitted that for all the attention these protests have received, they have not actually changed anything yet. Wall Street and the banks are still doing all of the things that the protesters are railing against. Without prosecuting them for their crimes against the middle and lower classes, and without new legislation that prohibits them from continuing their corrupt practices, the 99% will remain the abused victims of a greedy minority that cares nothing for them or their well-being. As long as corporations are allowed to continue calling the shots, nothing will truly change. I include such a large portion of his article because he writes so well, and because he raises some very valid points. He attacks the current liberal class for having removed itself from its ideals and submitting to the attractions of wealth and privilege, and he’s absolutely correct. He says that the protesters in the street are the only fighters left in the battle against Wall Street and the corporations that have taken control of our government, and again, he is correct. But, I would argue that the people in power that call themselves Liberals are not liberal at all. They have drifted to the Center (and some even further to the Right than that), and no longer deserve the moniker of a liberal class. They have betrayed most of what that name stands for. I would encourage the protesters in the streets, at Wall Street and across America, to take back that name, for they are the true liberal class now. He calls them radical dissidents, and perhaps they are, but they are also the new voice of the Left. As such, they have a responsibility to shift the balance of power. As Conservatives and old-school Liberals have moved further and further to the Right, it is now the task of this new class of true liberals and radicals to strengthen the Left and keep everything that they stand for from being swept under the rug and forgotten. But there are other possibilities. Democratic strategists across the country are no doubt pondering how the somewhat unfocused demonstrators can be turned into a “Tea Party of the left” that can be deployed as reliable Democratic voters in future elections. Other members of the progressive establishment may try to co-opt this essentially anti-political movement into the elaborate structure of single-issue progressive patronage networks. Maybe occupiers can be persuaded to join minorities, women, LGBTs and environmentalists as officially sanctioned progressive interest groups. Maybe in 10 years there will be foundation-funded Occupation programs, each with their own well-paid administrators, followed 20 years from now by endowed chairs in Occupation Studies, occupied by chubby, middle-aged veterans of Zuccotti Park. There is a third, more promising possibility. Instead of provoking a conservative backlash, or being co-opted by the existing progressive identity-politics machine, the Occupy Wall Street movement could indirectly benefit the American center-left by re-creating an American radical left. It’s been a long time since economic, anti-corporate and liberal populism has lit a fire among ordinary Americans. As for popular protest, it’s been even less successful in mobilising public opinion. From this perspective, OWS has arisen not because of the left’s activism, but despite it. Focusing on electoral victories and legislative accomplishments, the left has failed to push an effective populist movement, focusing its energy more on social issues than economic ones. Democratic leaders have stayed at arm’s length from the party’s activist base for fear of being stained by their perceived political excesses (a position that has rightly alienated a generation of liberals). Considering these larger failures of the left, it seems almost appropriate that OWS has come about in such an organic and ad hoc manner. It raises the question of what this all means for American politics and, in particular, next year’s presidential election. There is certainly the possibility that the demonstrators, many of whom are firmly ensconced on the fringes of American politics, will spark a backlash or that the movement, which still lacks a clear agenda, will fizzle out. But there is another real possibility – that OWS will affect the near-term trajectory of American politics. While many of the protesters are unhappy with the current progressive president, their grievances and demands are very much at one with Obama’s emerging re-election strategy. The Occupiers have called themselves the other 99% – to contrast themselves from the richest 1%. For a president intent on running as an economic populist, a populist political movement might just be what the doctor ordered. No doubt Obama would have liked to see a movement like this a few years ago; it might have helped him pass his agenda through a recalcitrant Congress, but, hey, better late than never (and on this, he is hardly blameless). So, the Occupy Wall Street protesters are beginning to have an effect on national politics. Instead of running from that fact, they should be embracing it. They have captured the attention of the entire world, and now they have a chance to enact meaningful changes that address the concerns of the 99% of this country that they stand for. Though they have repeatedly said that they don’t have any kind of official leadership, and their success up to this point may be in large part because of that fact, it remains that without having people representing their interests in positions of power within the government, their movement is in danger of fading away before they are able to make the changes they are hoping for. The various protesters across the country see themselves as part of a movement, and they shun any comparisons to the Tea Party, and with good reason. The Tea Party was a movement that was quickly co-opted and corrupted by aligning itself with the Republican Party. Add that to their policies against the middle and lower classes, as well as the elderly and the sick, and it’s easy to see why the Occupy Wall Streeters would want to distance themselves from the Tea Party. But, the Tea Party does deserve credit on one count. By electing people sympathetic to their cause, however despicable it might be, they were able to have their voices heard in Congress, and were able to influence legislation. This is the sort of influence that is now needed by the current crop of protesters. There are already hints that the protesters are coming to these same realizations. There are rumors of an upcoming National General Assembly scheduled for next year, featuring delegates from all of the various protests representing each of the nation’s Congressional Districts. This would be a great first step, but it is not far enough. The only way to truly change the process by which our government works is to become directly involved in the government and the decision-making process. But, instead of being co-opted by the Democratic Party, they should co-opt the Party instead. They need to force them to move away from the Center, and back to the Left where they belong. They have made it quite clear what issues are important to them and important to the American people. Democrats suffered huge losses in the last election cycle, and unless they are able to rediscover what it is that they should be standing for, they are in danger of becoming less and less relevant. They have compromised again and again, to the point that they have abandoned their constituents. The people want a liberal voice in government, and Occupy Wall Street has become that voice. They need to make that voice heard. And, if the people in Congress don’t want to speak for them, then they need to get people elected that will. They need leaders, not just among themselves, but in the government. This may seem contrary to the horizontal leadership of the current General Assemblies, but it is necessary if these protests are to have any hope of becoming more than just a movement. And, they have the potential to be so much more. They are in a position where they have the support of a majority of the country. Now, they have to turn that support into actual change.